An Amateur Radio Station Located in Perth, Western Australia. Updates and news from VK6IA Andrew Albinson. A new 3 elelment Steppir 13.8Mhz to 54Mhz Antenna system now has pride of place on the VK6IA tower! The antenna was supplied by Lee Andrews of Andrews Communications Sydney. He had an antenna in stock and delivered it to the other side of Australia in only a few days! 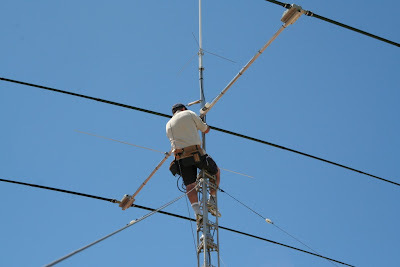 Thanks again to John VK6AI for all the tower work! The 3 element Steppir is on a 16ft boom with 36 ft long elements. 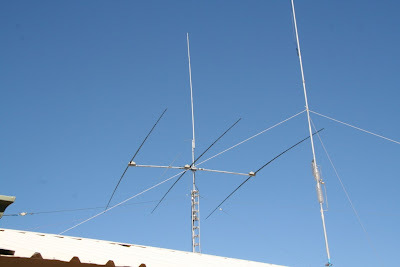 Above is the Diamond X510 Vertical Colinear for 2m and 70cm. 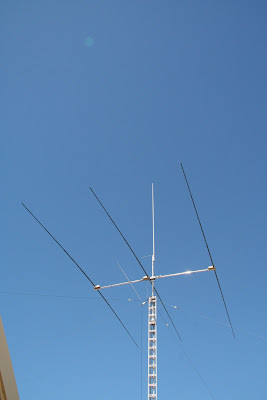 The below photo shows the butternut HF6V vertical with the SteppIR visible also. So far, the performance is very pleasing. the 180 degree function demonstrates the antennas front to back is very very good indeed! In the above photo, you can see the 6m Passive element as a director in front of the driven element. 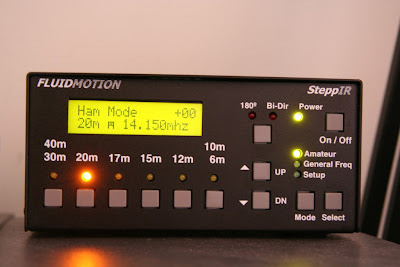 VSWR on all bands is 1:1 at the controllers chosen frequency. 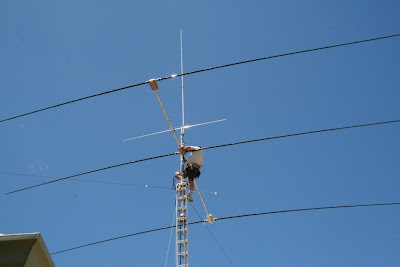 Great Antenna Andrew, no wonder you have been getting so much DX!! Good to see you on WSPR Andrew, it is perfect for zero sunspots. If you have any questions about WSPR feel free to ask, I have been on it for over 1 year. I use very Hi-Q antennas, extremely narrow bandwidth all at 1:1. I often beam Europe and The states from 40M up to 15M. Best TX is to Ross T61AA in Kabul on 10M using 100 mW. Great to talk with you today Andrew from my pedestrian mobile here in Blackpool,your signal was 59+! You have a nice set-up and that accounts for the great signal! The WX was freezing fog when we had our QSO, so I think people thought I was mad when they saw me walking down the beach with the trolley and the 11 foot antenna! I get out either bike or pedestrian mobile quite often especially when the WX is good. 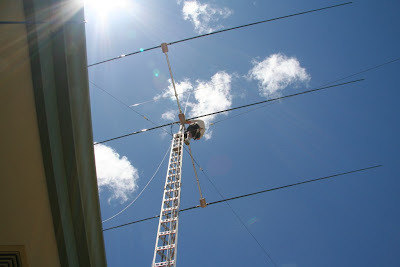 Ham Radio Station VK6IA is operated by Andrew Albinson from Ballajura Western Australia. Locator OF78WD.